For four weeks this summer, American University science faculty taught DC middle school teachers how to develop innovative and effective new science curriculum for their classrooms. 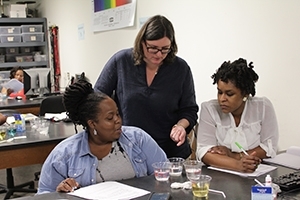 The program, named the Learning and Teaching Science with Scientists Institute, was funded by the DC Office of the State Superintendent for Education (OSSE) through its Mathematics and Science Partnerships Grant Program. The grant was awarded to AU's science departments and School of Education in partnership with the Ideal Academy Public Charter School in DC. In all, 14 DC public and independent school teachers completed the training: 4 from Ideal, and 10 from other DC middle schools. "AU is uniquely suited for this program because of the strong relationship between the science departments and the School of Education," said Danielle Sodani, director of Project Development and Community Outreach at American University's School of Education. "Through programs like Lab2Class, a NSF-funded initiative that prepares new science teachers to teach in DC schools, AU education faculty and science faculty have explored the issues of teaching and scientific inquiry as a way to deeply engage K-12 students in science disciplines." The participating teachers completed weeklong one-credit graduate courses in biology, chemistry, environmental science, and physics, followed up a three-credit education course that helped them create lessons plans for their classrooms using the science content they learned. They tested their lesson plans at Ideal Academy's summer school with students in grades 3-8, and they will officially implement the new curriculum in their classrooms this fall. The new curriculum was developed in response to new state and national science curriculum standards named Next Generation Science Standards (NGSI). "The goal of the institute was to help teachers develop curriculum based on the new standards," said Nancy Zeller, AU's coordinator of science teaching labs and the grant manager for the institute. "The Next Generation Science Standards emphasize both science content and the scientific process," said Zeller. "One of the reasons why the institute was such a success was because our faculty taught the teachers the processes that scientists use when they conduct research in their labs: to make predictions and set up experiments to test those predictions. The teachers learned that by giving the students something to observe or analyze, and by guiding them through the scientific method, the students also learn the content. It is a more effective way of teaching science." Four undergraduate students will assist with the grant. This summer Kirk Blackmore (biochemistry '15) and Nikita Srivastava (physics '15) assisted with the science courses. In the fall, two more undergrads will join them in helping to implement and evaluate the lesson plans at the participating middle schools. The Learning and Teaching Science with Scientists professional development program will continue throughout the upcoming academic year. "AU undergraduate student assistants and faculty will work with teachers in the program's partner school, Ideal Academy, and other DC schools to implement the lessons they created this summer. Preliminary data already show that the program has increased teachers' knowledge of the inquiry approach to teaching science," said Sodani. The institute was a real partnership between the faculty members and teachers, said Zeller. "Everyone worked together enthusiastically, and as a result, the AU science faculty members look forward to seeking similar science education grants in the future. There was nothing more fulfilling than watching the students at Ideal Academy in lab coats investigating electric circuits, germinating bean seeds, and analyzing a forensic robbery scene. We hope to create more opportunities like this in the future."